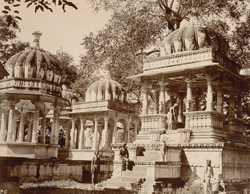 Photographs of cenotaphs at Ahar, from the 'Reading Collection: Views of Udaipur' taken by an unknown photographer c.1910. The photograph is part of an album containing architectural and topographical views of sites in Rajasthan, mainly of Udaipur, originally in the collection of Rufus Daniel Isaacs, Lord Reading, who served as Viceroy of India (1921-1926). In the mid-16th century Udaipur became the fourth and last capital of the Mewar State, ruled by the Sisodia Rajputs. The cenotaphs stand in the royal cremation ground at Ahar, a short distance east of the city. The first royal cenotaph to be built was that of Maharana Amar Singh (r. 1597-1620). The cenotaphs take the form of carved marble chhatris, domed memorial structures supported by columns and raised on plinths.